Remember when 500MB/s felt insanely fast? These days, the storage devices at the helm of most modern devices run circles around the hard disks that were commonplace not that long ago. Speeds well in excess of 1,000MB/s are available from tiny M.2 drives, making ultra-fast storage available to PCs of all shapes and sizes. We get to have fun testing some of the fastest drives around, but what do people actually use on a regular basis, and what sort of performance are they seeing as drives age? To find out, we're asking: how fast is the storage in your PC? 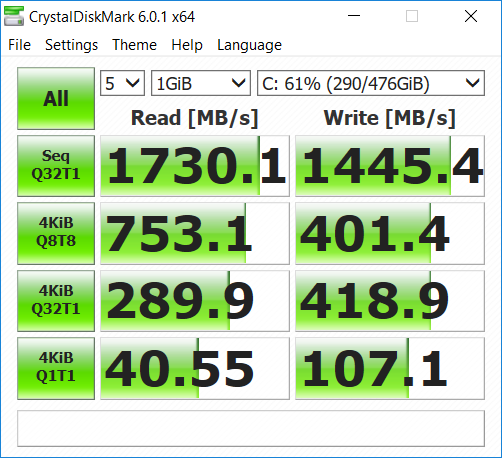 To get some quick-and-free numbers, we recommend running Crystal Disk Mark, available from the Microsoft Store or as a standalone download from crystalmark.info. It's a test that takes little time, and we're intrigued to see what you get in terms of sequential read and writes at a queue depth of 32 (i.e. the top row of results). Do let us know which drive you're using, and how long it has been in situ, and if you're disheartened by your result, go ahead and enter our competition to win a Toshiba SSD bundle. Acer launches Helios 700 gaming laptop with sliding keyboard Nvidia GeForce RTX 2080 Ti overclocked to 2.94GHz QOTW: What wattage is your power supply? HEXUS Week In Review: WD Black SN750 and PC Specialist Vortex S1 Has Samsung been chosen for Intel Xe GPU manufacturing? My two main drives, the Samsung 970 EVO 1TB NVMe and the Corsair MP510 960GB NVMe . I think the write performance of the Corsair is being hindered by it being almost full. It's exclusively used for games so write speeds are of very little concern anyway. Main PC has a couple of SSDs connected via SATA3 and a couple of HDs on SATA2. Laptop has a 970 EVO NVME and a SATA3 SSD. The difference in speed between the NVME and SATA SSDs isn't noticeable through normal use or gaming. Indeed, I use normal HDs on SATA2 for most games, World of Tanks(HD client) being an exception that really benefits from being installed on a SSD. Don't waste your time running benchmarks on storage. Do you mind if I turn that right back around at you and tell you that it is in fact you that has wasted your time. You have just explained that NVMe drives are faster than SATA 3 drives, but the difference isn't noticeable, and that HDDs are slower again, in a thread that has been started with the sole aim of finding out who has the fastest storage. There is only one way of finding out who has the fastest storage - benchmarks. Both drives are approximately a month in use (new build). The difference in speed between the NVME and SATA SSDs isn't noticeable through normal use or gaming. Benchmarks to provide some evidence of this? I've gone from 4 x SATA SSDs running in Raid 0, to two single NVMe drives (OS/Games). Everything from starting my PC to loading games to level loading has noticeably improved using NVMe drives.